It may not be a three-day survival test like they give eighth graders in Ketchikan. But my four-hour trip to Misty Fjords National Monument gave me a glimpse into the natural beauty of southeastern Alaska. My adventure showed me the spirit of Alaskans as well as the scenic beauty. The national monument is part of the Tongass National Forest, comprising 2.3 million acres of rain forest in the Alaskan Panhandle. It is 40 miles east of Ketchikan. And yes, one of the finals in the eighth grade is a local version of “Survivor: Ketchi kan.” To hear deck hand Elizabeth Jagusch tell it, it’s not that bad – EXCEPT for the constant rain, no food or water. But what the hey, that’s why they take survival training in the local schools. And Jagusch got an A+ in her survival test. She didn’t get eaten by a bear, suffer from hypothermia or starve. 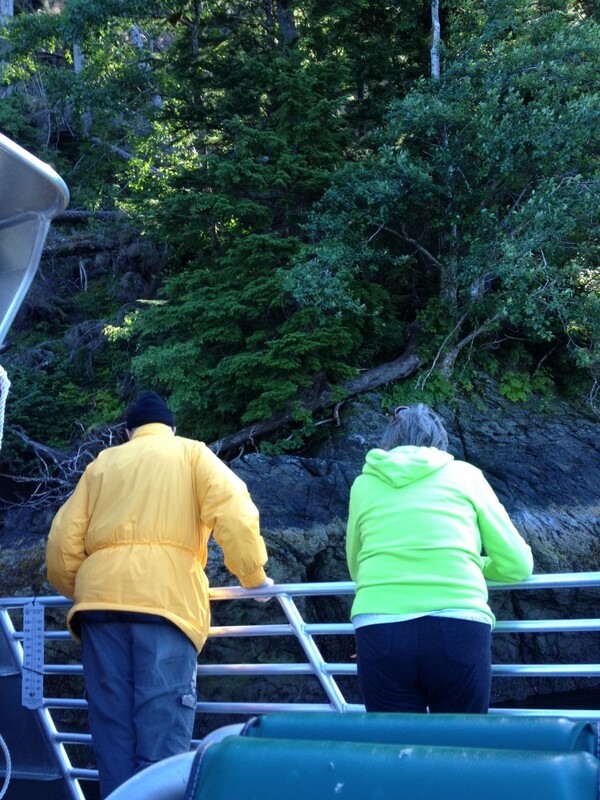 Her stories are just one of the many things that make the Misty Fjords trip so enjoyable. That and the fact that the naturalist on board turned out to be the son of a long-time friend and fellow ski writer Bob Cox, whose column has run in the Torrance Daily Breeze for many years. Randy Cox grew up in Torrance. After school, he moved to Flagstaff, Ariz., where he’s a ski instructor in the winter. This year, Randy decided to take a summer job in Alaska, landing up in Ketchikan. Torrance native Randy Cox talks about Misty Fjords National Monument. Our group was traveling on a high-speed catamaran to Misty Fjords. We had sailed into the harbor at 7 a.m. on Holland America’s Westerdam. And departure was set for 1 p.m.. so we didn’t have much time. Fortunately, this tour company combines the high-speed cat, (think Catalina Express) with a return by seaplane. Even at 30 knots, the trip to the national monument took 2 and a half hours. Along the way, Capt. 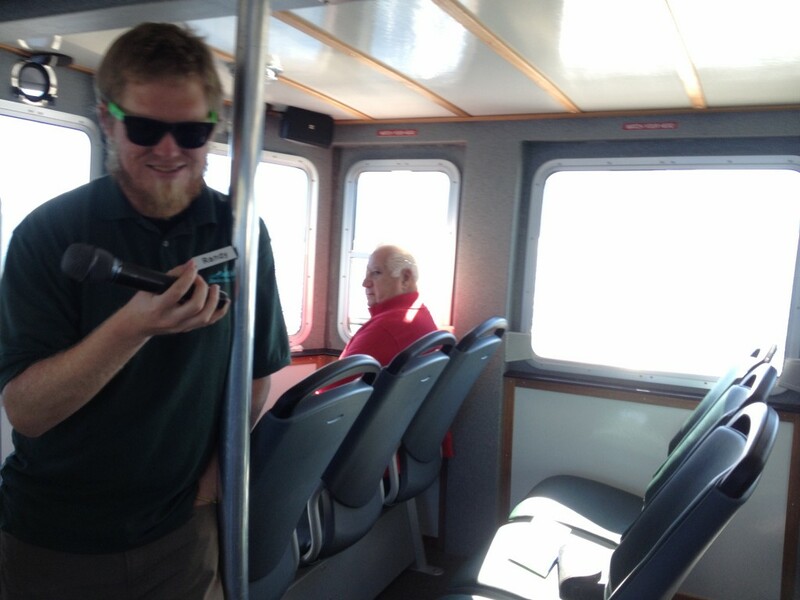 Keith Reeder, Randy and Elizabeth kept the passengers entertained with interesting stories. They mixed facts with local flavor to capture the spirit of the Far North. These granite mountains were carved out by glaciers during the Ice Age. Randy said the monsters were 6,000 feet high. Boulders the size of houses scored the mountainsides, giving them the striations you still see today. Today, the u-shaped fjords are 1,000 feet deep, bracketed by cliffs rising another 3,000 feet. The mountains are often shrouded by the moist air rising from the fjords, giving the wilderness its name. Hundreds of islands dot the landscape. Annette Island is the only native reservation left in Alaska, according to Randy. Every clan but one took the money, about $1 million each according to the naturalist. The tribes used the money to form corporations, some of which are the largest in the state today. A different island is used for the survival challenge every year. And the name of the island is no longer announced to the public. He said parents actually like the training. Ketchikan is a small, isolated town so there are no malls to hang out in. Instead, kids climb into their boats to explore the scenic wonder in their own backyard. Parents worried when their children couldn’t make it back because of storms or engine trouble. “So survival training begins in the sixth grade and ends with the survival final,” Elizabeth said. The 14-year-old was dropped off with 20 other young women on a small island. An adult watched for safety as well as grading each teen. Elizabeth said students could bring a sleeping bag and a 10 by 10 foot tarp. And an empty Folgers can became an important tool, being used for digging, carrying food and water. She said the first day was spent building shelters from the tarps in the pouring rain, drying wood for fires, digging a latrine and boiling water to drink. On the second day, the students gathered food from the forest. By the third day, the kids were hungry for some protein, so they sharpened sticks into spears and waited for the tide to go out. Then they stabbed crabs as well as a two-foot long halibut in a small pool. The crew kept us entertained with interesting information and stories. At one point, we powered down and slid up to one of the imposing granite cliffs. Reaching out, Randy pointed to some of the starfish clinging to the rocks. He pointed out a band of iron oxide that gave the rock an orange color. Huge trees hung over the sides, clinging to the bare rocks by their shallow roots. Randy showed us a band of trees that had been knocked down by high winds. Off in the distance, I spied a tower jutting out of the center of the fjord. Was it a ship? An oil derrick? I couldn’t hold my binoculars steady enough to figure it out. Finally, Capt. Reeder explained that the 237 foot tall basalt rock was a volcanic plug. 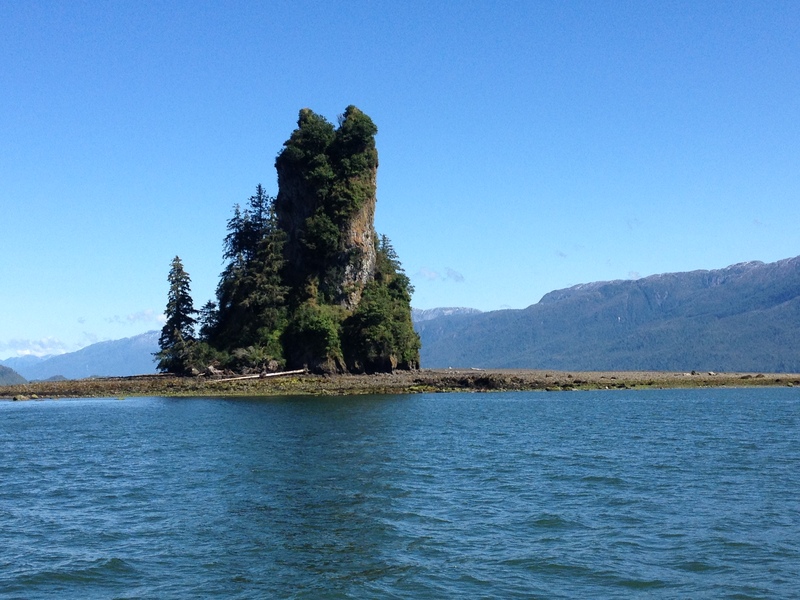 It was named New Eddystone Rock by famed explorer George Vancouver while searching for the Northwest Passage. John Muir compared Misty Fjords with Yosemite Valley because of its similar geology. Light colored granite is gouged out by the glaciers, leaving the distinctive u-shaped valleys. Randy described the Western Hemlock, Sitka Spruce and Western Redcedar that cling to the mountainsides. He even had saplings of each for the children to touch. Soon we reached the floating dock, where seaplanes would fly us back to our cruise ships. Suddenly, two seaplanes banked around a curve, gliding gently down to alight in the calm water. Puttering up, the pilots cut the engines just in time to slide gently into the dock. I’d always dreamed of flying a float plane in Alaska. And I got a classic DHC-3 Beaver to try it in. The high-wing prop plane was developed by de Havilland Canada for a short take-off and landing. The 1950s era instruments shared cockpit space with modern radios and GPS system. An old-fashioned yoke rested in the pilot’s lap. 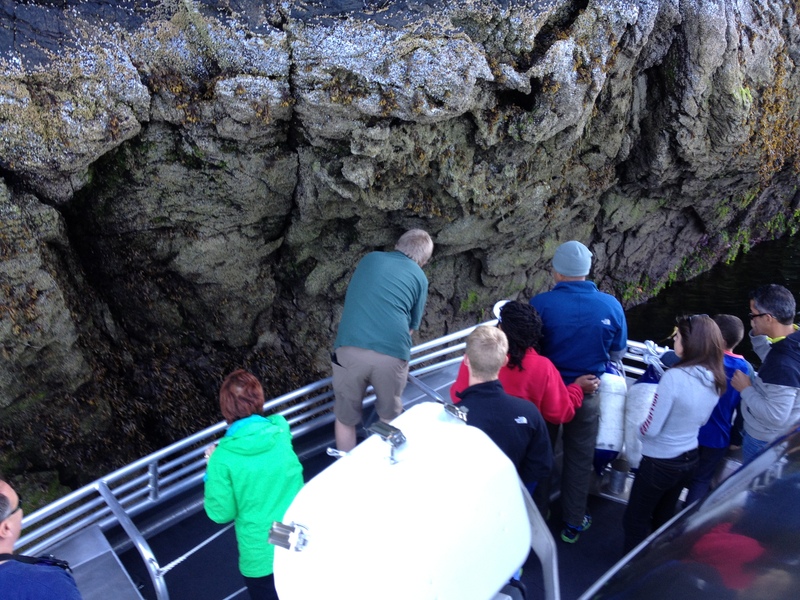 Naturalist points out star fish living at base of cliffs in Misty Fjords National Monument. Alaska’s most popular bush plane has been upgraded with noise cancelling headphones and large viewing windows. The headphones made conversation possible over the loud radial engine roaring only a couple feet ahead of me. Taxiing out into the fjord, the pilot slowly added power until the pontoons left rooster tails behind us. Breaking free, we rose slowly through the valley, the granite cliffs bracketing us on either side. The aerial adventure gave us another perspective of the national monument. As we wheeled through the skies, we felt like the Bald Eagles who populate the place. Soon, the pilot had us back to civilization, where we landed smoothly next to the giant cruise ships nuzzled against the docks. We would soon be back aboard the floating hotels, where our survival skills would only be tested in the bars and casino. Today, The Westin St. Francis will be transformed into a festive oasis, embellished with spectacular holiday decorations created by Joe Vincent Designs. Upon entering the historic Landmark Lobby, a 15-foot, glimmering white and silver holiday tree decorated in energy saving LED lights will transcend into different colors. Families will delight in the whimsically adorned Tower Lobby, featuring a soaring 18–foot tall tree. 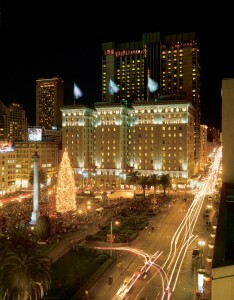 A winter wonderland will be displayed over the front desk with arrangements of beautiful metallic apple green and pale gold Christmas trees and an assortment of glittering green boxes surrounded by gold garland, patches of snow and clusters of dripping LED icicles adorning the length of the overhang. The wait is over for wine, spirit, cocktail and food connoisseurs anticipating the return of Cornucopia presented by BlueShore Financial and even Mother Nature got in on the fun with a fresh blanket of snowfall in Whistler. Now in its 17th year, Cornucopia kicked off yesterday, with expanded programming now over 11 days. Cornucopia goes far beyond food and drink, offering an educational component as well as a new health and wellness series. Featuring the long-standing favourite wine tastings, seminars, dinners and parties alongside new additions including the Nourish health and wellness series, the educational component with the Wine and Spirit Education Trust Courseand seminars and events on everything from wine, spirits, cocktails and craft beer, Cornucopia offers something for every taste. MGM Resorts International invites those chilled to the bone to come visit The Strip with Vegas Winter Getaway packages. All visitors will enjoy 20% off room rates at Mandalay Bay, MGM Grand, The Mirage, Monte Carlo, Luxor and Excalibur, plus happy hour offers, limited-time prices on show tickets and spa specials. Ventura Harbor Village and Ventura Harbor are inviting visitors to get in swing in celebration of the holidays ahead with the debut of its Wine, Dine & Jazz Sundays at three art galleries and 10 seaside restaurant venues in November from noon – 3 p.m. Visitors to this seaside enclave will enjoy live jazz, accompanied by wine and dine specials, tastings and wine flights. Wines from California, Greece, France, Italy, and Chile will be featured on restaurant menus. Performers include the Jon Stanger duo, Toni Jannotta duo and Justin Claveria trio. Participating restaurants will offer wine flights, tastings, and pairings, and include 805 Bar & Grilled Cheese, Andria’s Seafood Restaurant & Market, Le Petit Café & Bakery, Margarita Villa Mexican Restaurant, Milano’s Italian Restaurant, Spinnaker Steak & Seafood Broiler, Rhumb Line Restaurant, and The Greek at the Harbor, all overlooking the boats on the water. Three art galleries will also offer wine tastings, including Harborside Village Gallery & Artisan Store, Tina O’Brien Gallery & Studio and Ventura County Potter’s Guild. Admission and parking are free for Wine, Dine & Jazz Sundays. For those wishing to spend the weekend harbor-side, they can opt for “Seas the Day Stay & Play” special guestroom rates offered at the Four Points by Sheraton Ventura Harbor Resort priced from $109* Sunday – Thursday midweek special, and $119* Weekends with (two) night minimum stay required, and $10 parking. For additional information, call (805) 658-1212, ext. 1290 – CODE “Ventura Harbor Village Fall” (Package Code 4239) to schedule dates. www.VenturaHarborVillage.com. The Half Moon Bay Art & Pumpkin Festival draws many visitors to the “World Pumpkin Capital” on historic Main Street. This year’s 43rd annual festival will be held on October 19-20 from 9 a.m. to 5 p.m. Admission is free. The Big Week launches with the World’s Greatest Gourd Growers and their enormous orbs gathering for the 40th Annual SAFEWAY WORLD CHAMPIONSHIP PUMPKIN WEIGH-OFF, the Super Bowl of weigh-off events, on Oct. 14. Organizers are offering $25,000 in prize money for a new world record entered at Half Moon Bay. The current world record is 2009-pounds –– the monster pumpkin was grown by Ron Wallace and set at a weigh-off in Topsfield MA in 2012. Defending Half Moon Bay champion Thad Starr, of Pleasant Hill OR, obliterated the formidable field of heavyweight contenders at last year’s Half Moon Bay weigh-off with his 1,775-pound mega-gourd that set a new California weigh-off record. Starr is expected to return along with a host of accomplished, veteran growers to contend for the $25,000 world record prize. The grand champion mega-gourd, along with the top five weigh-off pumpkins, will be displayed at the Pumpkin Festival, October 19-20. There’s a smashing lineup of entertainment on three stages featuring everything from contemporary country, pop reggae, Latin rock, salsa, blues, folk, classic and Celtic rock music by some of the Bay Area’s top bands. Shop America’s finest artists while browsing 275 booths featuring original work in glass, ceramics, metals, fiber, leather, wood, jewelry, and fine art. “Made on the Coast”, a dedicated Locals’ Artists Block, returns with an expanded lineup of fine art, crafts, live music, a book and author booth, and a haiku contest (on Sunday only). Enjoy popular events like pumpkin pie-eating contests, a Halloween costume contest, pumpkin carving for fun (no judging), Young Actors Workshop’s bone-chilling Haunted House, the Great Pumpkin Parade (Saturday, 12 noon), a Pancake Breakfast, and the 5k & 10k Pumpkin Run. Soar high above the crowd on our awesome new Zip-line in Stone Pine Center, making its festival debut. Catch massive air on Spider Jump’s super fun bungee jump in the Gazebo area. The festival is a fabulous feast famous for its homestyle dishes, with many featuring product from local farms. The sweet and spicy pumpkin, naturally, takes center stage: savory treats like pumpkin pancakes, pumpkin pie, pumpkin bread, pumpkin cake rolls, pumpkin cheesecake, pumpkin cookies, pumpkin ice cream, pumpkin smoothies, pumpkin churros, chicken pumpkin sausages, and, new this year, warm pretzels with a pumpkin sauce and pumpkin seeds. AJ Hackett Bungy will celebrate 25 years of bungy in spectacular style with 25 days of events, promotions and competitions culminating in a ‘not-to-be-missed’ party on Nov. 12. As the official ‘World Home of Bungy’, Queenstown’s historic Kawarau Bridge will be the focus of celebrations. Over the 25 years more than three million people have bungy jumped at AJ Hackett Bungy sites around the world. Celebrity visits to the four New Zealand sites include Katy Perry, Justin Bieber, Jack Black and Tiger Woods. AJ Hackett Bungy co-founder and director Henry van Asch said he was “overwhelmed and incredibly proud” to see the company reach the quarter of a century milestone. “For 25 years AJ Hackett Bungy has encouraged people to step outside their comfort zone, balancing the perceived risk of jumping, swinging and now zipping from a great height, with the most stringent of safety measures,” he said. People can follow celebrations on the AJ Hackett Bungy Facebook page and are encouraged to use the #25yearsofbungy hashtag on social media sites. Bringing a taste of Munich to Waikiki, Outrigger Reef on the Beach will host its first-ever Oktoberfest event this October 17 to 19 – welcoming guests and locals alike to come enjoy traditional Bavarian food and festivities. Guido Ulmann, the German-Swiss executive chef from the Outrigger Reef on the Beach,will be expertly preparing all of the traditional dishes associated with Oktoberfest. In the spirit of Oktoberfest, The Edelweiss Trio will be performing traditional German music, dressed in authentic Bavarian dirndl and lederhosen. The Edelweiss Trio has become a staple Oktoberfest performers having performed in Honolulu for more than 35 years, bringing their particular brand of oom-pah to the islands. San Diego Museum Council invites kids to explore San Diego’s diverse museums – for Free! From October 1 – 31, children ages 12 and under receive free admission with a paid adult (limit 2) at close to 40 museums – Visit them all! Just download the coupon at the San Diego Museum Council link below. Explore the hidden treasures of the ocean or the far reaches of outer space. Delve into local history, visual arts, botanical gardens, architectural treasure in San Diego. A popular program for three years, Kids Free in October is presented by Time Warner Cable with support from the National Endowment for the Arts and the San Diego Commission for Arts & Culture.